Now, we are at the end of our musical journey, to be resumed next time, when Bach takes us on an even longer journey called the Art of the Fugue. These, then, are the musical tools which Bach has shown you, and countless generations of students, how to use, to be able to construct a dynamically developing, yet unified musical composition , where a single musical idea is turned this way and that, in order to explore the pregnant-possibilities it presents to a creative musical genius. The musical principles you have discovered enable a composer to take his or her original musical idea, and put it into dialogue with itself through a process of musical Socratic self-reflection. This experimental process leads to the creation of paradoxical relationships, which function as a "paradox-driver" for further musical development. This is also the first step towards writing fugues, or other compositions, with more than one subject, -- two, three, or in the case of the unfinished last fugue of Bach's Art of the Fugue, even four subjects. By solving of Bach's puzzle canons, you have re-lived a Socratic method for creating music. More fundamentally, by doing so, you are able to explore the creative power of human cognition itself. 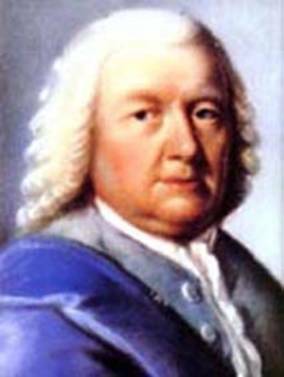 Could it be that Bach used the creative process involved in constructing this series of puzzle canons on a single theme, as a way to sharpen his mental pencil, to enable him to make the conceptual leap from the Ricercar in 3 voices, to the magnificent 6-voiced Ricercar, which he had been unable to make on the spur of the moment, in the presence of King Frederick? 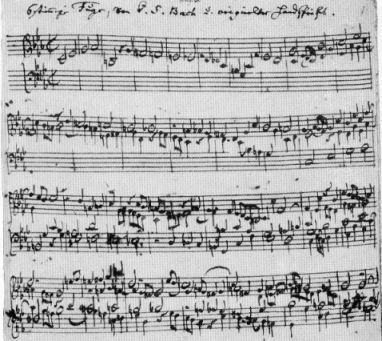 The beginning of the 6-voiced Ricercar, in Bach's own hand. I hope that our journey, with Bach as guide, has stirred up your own creative juices, and that you are now better equipped to make many journies through your own compositions, while keeping Bach's playful, ironical smile in your mind. There, during the last of an even more elaborate series of fugues, the guide posts suddenly end after the third fork in the road – in the midst of Bach's development of the third of a (thought-to-be) projected four subject fugue. This third subject is based on Bach's very own name! The theme consists of the notes "B-A-C-H" (with "B" being "B flat" in the German termonology, and "H" being "B"). ‘Thinking Through Singing’: The Strategic Significance of J.S. Bach’s A Musical Offering, by David Shavin, Fidelio Vol. IX , No, 4. Winter 2000. This article, by David Shavin, of the Schiller Institute in the US, both describes the political background of J.S. Bach, who in the tradition of Leibniz, attempted to get Frederick the Great out of the clutches of the Enlightenment, and discusses Bach's music. It is best to look at Shavin's description of some of the puzzle canons after you work on them yourself, as he "gives it away." Canons of the Musical Offering, Timothy A. Smith, has both the enigma canons, and the description of the solutions visible immediately thereafter. Again, don't look until you have tried to solve them yourself. Musical Offering notes pdf link In this file, the enigma canons are presented transposed to normal trebel and bass clefs in the first section, and the solutions in the second section. Don't peak at the solutions before trying to solve the puzzles. The ordering of the canons are different than here and on Timothy Smith's homepage. Mozart's 1782-1786 Revolution in Music, Fidelio, Winter 1992, by Lyndon LaRouche. Bach, Mozart and the "Musical Midwife," New Federalist, by Michelle Rasmussen. The "Royal Theme" from A Musical Offering in Dialogue among Bach, Mozart and Beethoven, Fidelio, 1997, by Ortrun Cramer, (has some of the puzzle canon solutions immediately visible). Beyond Bach: Beethoven's Study of Bach's Works, Fidelio, Summer-Fall 2000, by Ortrun Cramer.